As a child, I would go to church and make bracelets and I would get these little beads that I never paid much attention to. Uv beads are the tiny white beads used for bracelets that change color in the light. As someone could have guessed it is in the Uv light that the uv beads change colors. 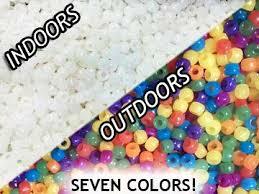 The beads can change up to 50,000 times until it is no longer affected by the uv light. Uv beads are also used to detect whether or not a sunscreen is good enough. There is a chemical inside the uv beads that make them change color. There has to be a 300-400 electromagnetic radiation in order for the beads to change. The dye molecules found in the beads are made up of two conjugated systems. 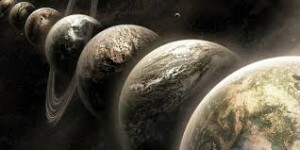 They form into one system. According to a source “When excited with UV radiation, the resulting larger planar conjugated molecule absorbs certain wavelengths of visible light resulting in a color” (1) This seems very exciting as I never knew the beads I used as a child were up beads. I presumed the beads came in those colors. Although they can change color according to the same source it says that “heat from the surroundings provides the activation energy to change the molecule back to its colorless structure” (1) They can serve as colorful beads for one project and return to white beads for another project. Liquid nitrogen can make beads not be able to turn back to their original white color. UV beads are a cheap way to have uv detectors. I also believe using Uv beads are a great way for children to learn about uv and electromagnetic radiation. I did not find that uv beads were used in any other studies to test things out. It would be nice to see if uv beads served a better purpose and could be used more. (1) Bell, Jerry A. “Visualizing the Photochemical Steady State with UV-Sensitive Beads.” J. Chem. Educ. Journal of Chemical Education 78.12 (2001): 1594. Web. Are essential oils beneficial for our health? For many months now I have been hearing about more people using essential oils in alternative to traditional medication. 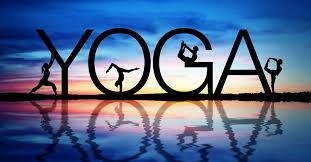 I have been wondering are essential oils beneficial for our health? 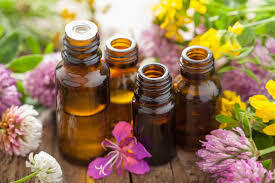 After conducting research, I have found that citizens use essential oils as a natural alternative for medication and it can be used for anxiety, depression, acne, physical pain, insomnia, and so much more. After finding out that it is claimed to help with things such as depression or anxiety it made me wary. How can oils help with disorders? I can understand that essential oils are used as a part of aromatherapy but does it help is what I am curious about. In the first source that it says that “there is limited scientific evidence that they actually improve people’s health or mood.” (1) That is discouraging to read. In another source, it says that one of the benefits to using essential oils in alternative to medication is that “Each plant is unique in its chemistry so essential oils are never exactly the same-this is different from pharmaceutical drugs that are synthetically reproduced to be identical every time.” (2) Since it says that essential oils are never the same I find this to be beneficial but also alarming. Medication being produced and being the same ensures that it will work for its purpose. Essential oils being different and not the same every time sounds alarming. What if it does not have the same results? The article continues to reassure my suspicions about there being scientific evidence of essential oils being a reliable alternative to prescribed medication. In the article, it says that “it is difficult to conduct blinded studies with aromatic substances and other researchers have used alternate scents assumed to have no therapeutic properties as controls. These approaches are problematic, however, because people associate smells with past experiences. Thus, it is difficult to account for individual variation in how essential oils affect people.” (2) People are still buying essential oils and are believing it does what it says it does. If there aren’t enough blind studies and the article says that “it is difficult to get approval and funding for essential oils” (2) then should essential oils be promoted the way they are. 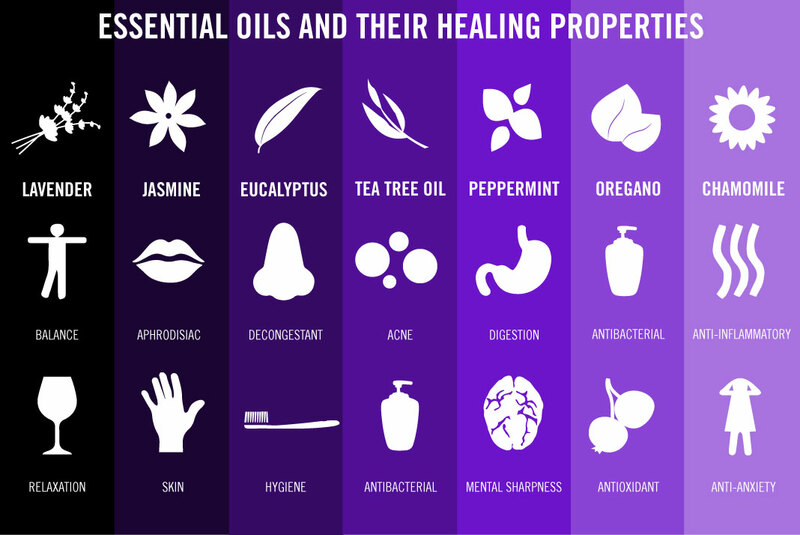 One of the arguments for essential oils supporters is that Rene-Maurice Gattefoss, a French chemist, commonly called the father of Aromatherapy, healed himself from a burn injury using lavender oil. This cannot be believed because this is the common evidence of an antidote. This cannot be reliable evidence as there is no science or no study. This is the same thing people did when answering the question do prayers heal? The studies that have been done on essential oils have not been large enough to say they really heal. There is one study that I found conducted on women students in a college but there were only 42 women in the study. The results were 60% of the women said the oils helped them. (3) Another study tested oils on 139 rats and 4 more experiments after that were conducted to see if oils had any effect on rats and their sleeping tendency. (4) Even after reading some of the studies done on essential oils I still believe there is not enough studies to fully say essential oils solves problems such as physical pain, physical healing of wounds and disorders such as depression and anxiety. 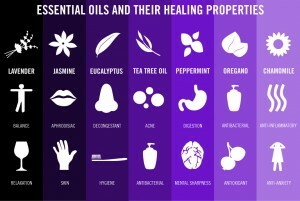 While it says, it is rare essential oils can still “induce side effects, such as rash, asthma, headache, liver and nerve damage, as well as harm to a fetus.” (5) Some women use essential oils on their children and with the side effects I would not want my child to come into contact with the oils. While some research is there I still believe there should be more research to prove with science that it is very safe to use essential oils in alternative to pharmaceutical drugs. Nierenberg, Cari. “The Science of Essential Oils: Does Using Scents Make Sense?” LiveScience. TechMedia Network, 03 Sept. 2015. Web. 17 Nov. 2016. Halcon, Linda. “What Does the Research Say About Essential Oils? | Taking Charge of Your Health & Wellbeing.” Taking Charge of Your Health & Wellbeing. N.p., n.d. Web. 17 Nov. 2016. Taehan Kanho Hakhoe Chi, Taehan. “[Effects of Lavender Aromatherapy on Insomnia and Depression in Women College Students].” National Center for Biotechnology Information. U.S. National Library of Medicine, Feb. 2006. Web. 17 Nov. 2016. Komori, Teruhisa, Takuya Matsumoto, Eishi Motomura, and Takashi Shiroyama. “The Sleep-Enhancing Effect of Valerian Inhalation and Sleep-Shortening Effect of Lemon Inhalation.” The Sleep-Enhancing Effect of Valerian Inhalation and Sleep-Shortening Effect of Lemon Inhalation. N.p., 20 July 2006. Web. 17 Nov. 2016. Ehrlich, Steven D. “Aromatherapy.” University of Maryland Medical Center. N.p., 09 Aug. 2011. Web. 17 Nov. 2016. This entry was posted in Uncategorized on November 17, 2016 by lkr5215. Why do we tear up when peeling an onion? 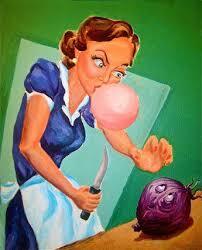 Have you ever wondered why you tear up when your peeling an onion? It hurts and it makes it a harder thing to do when preparing a meal. Onions have a lot of good nutrients that are good for our bodies but when we crush onions we make their tissues release something. Onions release these sulfonic acids and it converts to another type of chemical called the s-oxides. The smell of the onion is usually a reason people think why they tear up with chopping onions but it is the s- oxide that makes a person tear up. 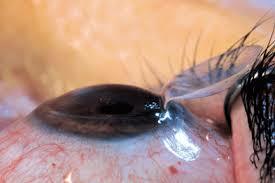 The cornea of the eye tries to protect itself from irritating things making the burning sensation happen. Then people start rubbing their eyes to get rid of the burning sensation when it only makes it worse. The onion leaves an odor on your fingers. Closing the eyes is bad idea as well. Some people have suggested heating up the onion before chopping it or lighting a tiny candle before chopping up the onion. It is interesting to see that something everyone always blew off as the smell has a lot of more explanation to it than that. I wonder if anyone would ever go as far as to try to engineer an onion without the oxide that makes us tear up. How would that effect the onion itself? I know for me growing up with my mom always tearing up chopping onions it made me scared to chop onions or get near them in the cooking sense. I never knew there was an actual scientific reason to people tearing up while trying to chop an onion or even just peeling the outer layer of an onion. I would like to know more about it but unfortunately haven’t found much scientific research on it. This entry was posted in Uncategorized on October 21, 2016 by lkr5215. 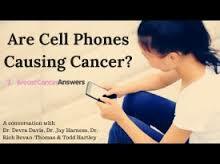 does using your cellphone cause cancer? If you are a girl I can assume you have put your phone in your bra as a storage place at least once. There have been many stories on sites saying it does cause cancer and some websites saying it does not cause cancer. The site I will like to take the side on suggests that there is not a direct link between the two but cellphone radiation in itself is a bad thing that may harm the body. On Cancer.org it says that since there is not a huge amount of radiation there is no way for it to actually tarnish the DNA. There was a study that was done on rats to see if it even goes as far as to cause brain tumors. In it said that there was an increased risk of tumors in actually the male rats but with the female rats there was nothing wrong with them. The male rats after being exposed to the radiation were at risk. One thing to note though was that the rats were exposed at 9 hours a day. On the website it says this is higher but not accurate for humans since humans do not spend that much time on the phone talking. I believe that is not true. There are people that will not hang up the phone and are always talking on the phone for more than 9 hours a day. I myself can say at one point I was on the phone for at least 13 hours. There were new findings to say that though it was not linked to cancer that the brain on the side the person held up the phone released more glucose than the other side that was not used. There was a study that went on for 13 years testing whether people with brain tumors was cellphones the cause and people without brain tumors and it found that it does not cause cancer. It is relieving to know it does not cause cancer but it is alarming to read that there may be other things that cellphones are doing to our bodies. Does this make you want to use your phone less? Maybe or maybe not. This is something that my generation is not paying attention to though it should be brought to our awareness. Have you ever wondered how does someone get their hair a cool pink or grey or any crazy color that doesn’t naturally belong? Well there is a process behind it. As someone who has been dyeing their hair for years I have come to realize something is on what to do and what not to do. You may recognize me in class as I am the only person in Sc200 with pink and blue hair. So what happens when someone wants their hair colors such as mine? You have to bleach the hair first. Naturally the hair particles are made up of blue and red molecules. When bleaching happens the hair cuticle needs to be open in order let the dye go in and develop into the hair. The harsh chemicals that usually scare people away from dying their hair is ammonia, peroxide and alcohol. These are the chemicals that can damage the hair. Ammonia allows the hair color whatever hair color it may be to deposit into the hair. Peroxide is the chemical that is used to break down the chemical bonds that were previously in the hair to lighten the hair to a blonde color. The specific thing that is being messed with in the hair cuticle is the melanin which is the reason why your hair is the color it is. One common thing most people do not know is that there are dyes out there that do not contain many of the harsh chemicals in the hair. It is possible to dye the hair without completely damaging the health of your hair. Doing simple things like sulfate free shampoo helps keep the color in reducing the amount of times of having to re dye the hair. Hair conditioning masks help keep the hair healthy and taking hair vitamins and putting oils specifically for color treated hair helps keep the hair alive. Overall the task of dying hair is actually a long process and affects the cuticle, the melanin and the cortex of the hair. 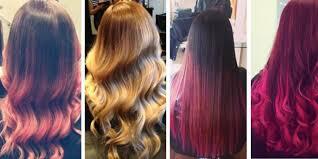 With the process of bleaching and lightening these things are compromised in order to let the new hair color develop and set in. Would you want to dye your hair after reading this? Would you not want to dye your hair after this? This entry was posted in Uncategorized on October 20, 2016 by lkr5215. Freezing your body: Would you do it? If anyone watches Golden girls such as myself then picture this: remember the episode where Rose convinces Blanche, Dorothy, and Sofia that if anything were to happen to her that they would have their brains frozen? I never imagined this was a real thing happening in science today. There is something called Cryonics where it is believed that storing someone’s body in a low and very cold temperature while having them fully immersed into liquid nitrogen. This sounds crazy right? But the first ever man to be have this done was in 1967 and the man’s name was James Bedford. His cryogenic freezing began so long ago and continues on even so today. There are many famous celebrities that have vowed to go through with the cryonic freezing. Cryonic freezing can cost as low as 28,000 which is pretty high to me but the highest I have seen the numbers is 200,000 dollars. The simplicity of the science explained here is the body is to be preserved until there is such a science that can make a person come back to life free of whatever disease he or she might have died from. This sounds very hopeless to me. It is a lump sum of money only for a chance for science to have developed far enough to make this possible. It is too much of a chance to take. There haven’t been any developments since the idea of cryonic freezing began. It has been over 49 years since the first man was filled with liquid nitrogen and there is still not a way to revive a person from that state. Many scientists do not believe in the practicality of simply having people wait to possibly have science save them not a definite. It surprises me that so many people want to do this because it’s a risk that probably won’t happen. Another thing is that why would someone want to come back to life? if it does work it would certainly take a long time and by then most of their love ones will be gone. What will be the point if everyone you knew was already dead? Why not let the body be natural and decompose and move on? What do you think? 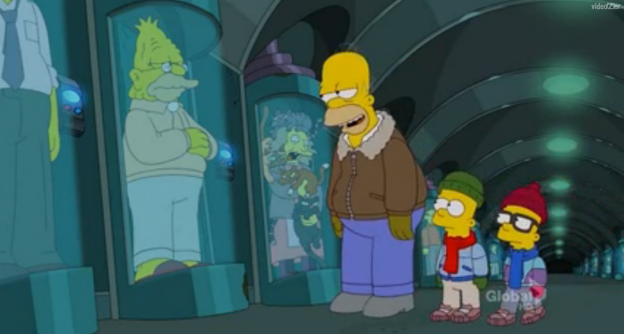 Would you try cryogenic freezing? Do you believe it is moral? Why isn’t there enough information on brain freeze? Picture this: it is a hot summer day and you decide to get ice cream. Since it is hot you try and eat the ice cream quickly but then all you feel is a sudden rush of pain in your head causing you to stop eating the ice cream. Have you ever wondered why does this happen? I do too and I decided to do some research on it. According to a journal article on the website medical news today where it explains brain freeze happens when something cold such as ice cream hits the roof of the mouth. The scientists from Harvard wanted to investigate and see why does brain freeze happen and they conducted an experiment to find out. The experiment included 13 adults and all they had to do was drink cold water with a straw. The scientists found that “the sensation of brain freeze appears to be caused by a dramatic and sudden increase in blood flow through the brain’s anterior cerebral artery. As soon as the artery constricted, the brain-freeze pain sensation wore off.” (Norqvist) I did not know this. As someone who is not a scientist my presumption of the cause of brain freeze was when your brain can feel the coldness. I acknowledge that there experiment only included a small number of adults and did not have a group drink the water without a straw. It would be better if there were a larger experiment to conduct the experiment to see if the scientist’s results are correct. The results cannot be held accountable as correct because it was not a large enough experiment and it only did one thing with the group not thinking of any other variables. I did not find any other experiment that tested for brain freeze so I cannot say or believe this to be true. My question is what would Andrew think of this? would he agree with the scientists from Harvard or would he want a larger experiment? It captures my attention that there is not much scientific data for something such as getting a brain freeze. I acknowledge there is someone else that has blogged about this but I have different questions. Nordqvist, Joseph. 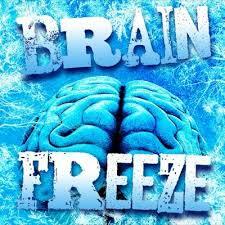 “Brain Freeze: What Is It? 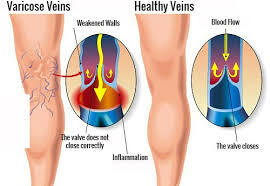 Scientists Explain.” Medical News Today. MediLexicon International, 04 June 2015. Web. 05 Oct. 2016. This entry was posted in Uncategorized on October 19, 2016 by lkr5215. I am a freshman and I have been here for almost a month and I have already caught the cold that’s been spreading around campus. Now my theory is because of the dining halls. Everyone touches the spoons multiple times and no one sanitizes their hands each time they grab a new spoon or utensil. This means that the germs are getting all over multiple people’s hands. A majority of people do not was their hands before they begin to eat their food and that’s how the sickness is spreading. Another thing is that when people are sick they still come to class. They are then coughing all over the place also spreading around the sickness. Another theory are the residence halls once someone gets it in the residence hall everyone gets it. For me I was okay but my roommate got sick which later spread to me. I am sure this is something common for everyone else. Since they’re communal bathrooms and everyone gets on the elevator this is another way for people to get sick. Overall since everything is shared it’s very easy to catch something from someone else and get sick. Germs are everywhere and they’re easily spread. But it’s a never ending cycle because of the people coming to class sick which includes myself. People when they are sick they’ll come to class anyway but that spreads more germs. I along with many of those people believe in going to class even if sick. Why? For one we all want to get an education. Number two these classes are not free. Number three missing class could cause someone to be behind and it will affect their grades. Does anyone else see where I am coming from? Can anyone else see the overlap? My solution would be to always wash my hands before touching anything or before I go to touch my food or anything like that. I would also wear one of those medical masks. I personally am not one of the people who are germo-phobes but I get very sick quickly and I would prefer not to get sick. For me personally I have a crappy immune system where once I get sick it’s very hard for me to get better. It takes especially long to get better even with the simple things like a common cold. I caught this cold going around two weeks ago. It’s been two weeks of me being sick non-stop with no progression of getting better. Another bad thing with having my immune system is whatever thing I get it makes me get my asthma. I have had asthma since I was three months old. But in recent years every time I get sick I get my asthma which leads to issues with breathing. In my experience since I have gotten here not only has sharing things lead me to being sick but also just walking around. When I am rushing specifically to this class since I come from the Hammond building people are always blowing smoke in my face. So not only am I already sick with breathing issues but things like this makes it work. The medical mask and washing my hands seems to be the very solution for me. I wonder does anyone else go through things like this? If so how do, they deal with it? How well do people deal with overall sickness and going to class? This entry was posted in Uncategorized on September 11, 2016 by lkr5215. Hi my name is Lucero Regalado. I had Math 21 on my schedule. After a week at New student Orientation my Lenfest adviser made the suggestion that I drop math 21 and her suggestion to replace the class was Sc 200. I followed her advice and that is how I now have this class. I am a English major. I do not do well in Math or science classes. I love English and I want to become an Actress. Being a science major does not sound right for my intended career field. But with taking this course I hope it changes my opinion on Science.